Rebecca M. O’Grady is part of Sullivan Hill’s Construction, Insurance and Commercial and Business Litigation practice groups. She practices primarily in the areas of construction and insurance litigation matters, with an emphasis on construction defect actions, construction claims and insurance coverage disputes. Ms. O’Grady’s experience includes representation of developers, contractors, landlords and other businesses in all stages of commercial and civil litigation. She has obtained favorable results on behalf of her clients, in mediation, arbitration, and by way of successful dispositive motions. Ms. O’Grady was admitted to the State Bar of California in 2010. Additionally, she is admitted to practice before the United States District Court for the Southern District of California. 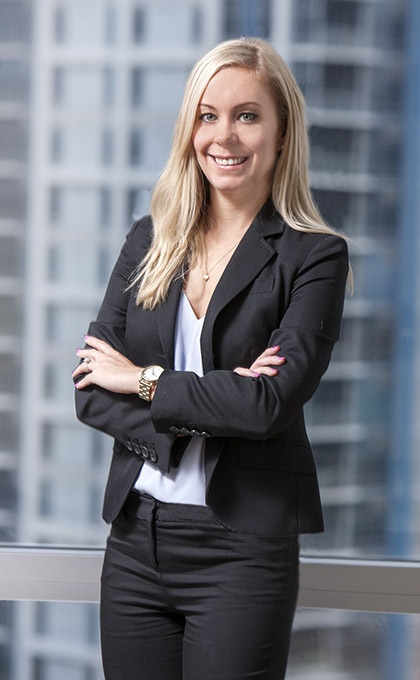 Ms. O’Grady has extensive experience in complex construction litigation, with an emphasis on construction defect litigation and coverage disputes. She has successfully represented developers and contractors in litigation arising out of multi-million dollar construction projects. Brought a successful summary judgment motion on behalf of a contractor against the owner of a multi-million dollar building who was claiming that the building was constructed with latent construction deficiencies. Successfully defended through arbitration one of America’s largest home builders in a multi-home law suit against claims that the homes were built in violation of building codes and with construction deficiencies. Brought a successful summary judgment motion on behalf of a national developer against an employee of a subcontractor who claimed that the developer’s negligence contributed to his work related injury. Ms. O’Grady currently serves as member at large for the Construction Law Section of the San Diego County Bar Association. She is a member of the California State Bar and the Lawyers Club of San Diego.